Located in Otocec in Slovenia's Dolenjska region, Hotel Sport provides air-conditioned rooms with private balconies and has its own restaurant. The hotel offers an indoor swimming pool and a sauna, as well as numerous outdoor activities like paintball, tennis, and an adventure park. All rooms at Sport Hotel are equipped with free Wi-Fi, satellite TV, telephone, and minibar. The rooms also have spacious bathrooms with a hairdryer. The Hotel Šport is located near Castle Otočec and it is located ~8Km (~ 5 Miles) from the KM 2017 Conference Venue, which is at Ljubljanska cesta 31a, 8000 Novo Mesto, Slovenia. The hotel is about 12 minutes by car to the KM 2017 Conference Venue . * - Please note that the prices above are at a pre-paid, non-refundable rate. However, cancellation insurance may be purchased during the reservation process (please read insurance coverage during payment process). 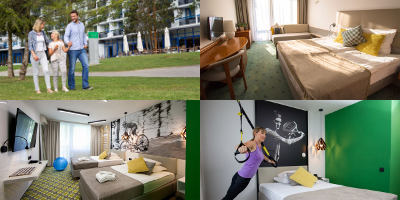 In the "Accommodation" drop-down list, choose "Hotel Šport"
In the "Access Code" box, enter "KM2017" and then click "Modify"
Add any additional supplements you may wish, and then click "Continue"
Fill in your personal details and choose your method of payment. Finally, click "Confirm Reservation" and we will see you in June!! In case of issues with the Hotel Šport reservation or for additional information about Hotel Šport, please contact: booking@terme-krka.si, with comments that you are KM2017 Conference delegate interested in booking for Hotel Šport. Ensure "KM2017 – Conference - Hotel šport" remains in the subject of the e-mail. The central location allows guests an easy access to the many delights of Novo Mesto, such as the city's cultural and historic sites, the museum, and the many shopping opportunities. The hotel has pleasant and comfortable rooms, offering everything required to make your stay a pleasant and memorable experience. 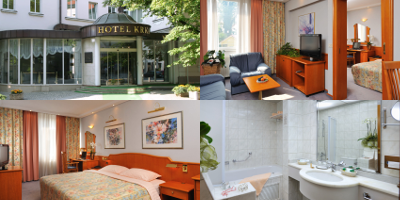 The Hotel Krka is located in the city center of Novo Mesto, which is filled with restaurants, cafes, and shops. The hotel is located within ~2.2Km (~1.4 Mile) walking distance of the KM 2017 Conference Venue (Which is at Ljubljanska cesta 31a, 8000 Novo Mesto, Slovenia). In the "Accommodation" drop-down list, choose "Hotel Krka"
Review your reservation details and then click "Continue"
In case of issues with the Hotel Krka reservation or for additional information about Hotel Krka, please contact: booking@terme-krka.si, with comments that you are KM2017 Conference delegate interested in booking for Hotel Krka. Ensure "KM2017 – Conference - Hotel Krka" remains in the subject of the e-mail. The Hotel Pri Belokranjcu is located in Novo Mesto approximately ~3.5Km (~2.2 Miles) from the KM 2017 Conference Venue (Which is at Ljubljanska cesta 31a, 8000 Novo Mesto, Slovenia). It is around 6 minutes drive by car to the KM 2017 Conference Venue . This is a small family hotel located 300m away from the old part of Novo Mesto. All rooms in hotel, except for four single rooms, are double bedrooms. Some rooms also have the possibility of an extra bed. There is free parking for all guests. Every room has cable TV, free WiFi, minibar, shower, and towels that are changed daily. For guests who stay longer, there is also the possibility of laundry services. Please note that the room rate does NOT include the 1,27 EUR per person/per night city tourists fee. Send an e-mail to hotel@pribelokranjcu.si (Attn: Mr. Aljosa Vrbetic), with comments that you are KM2017 Conference delegate. Ensure to include "KM2017 - Conference" in the subject of the e-mail. Please contact Mr. Aljosa Vrbetic (hotel@pribelokranjcu.si). Ensure to mention that you are part of the KM2017 Conference group.